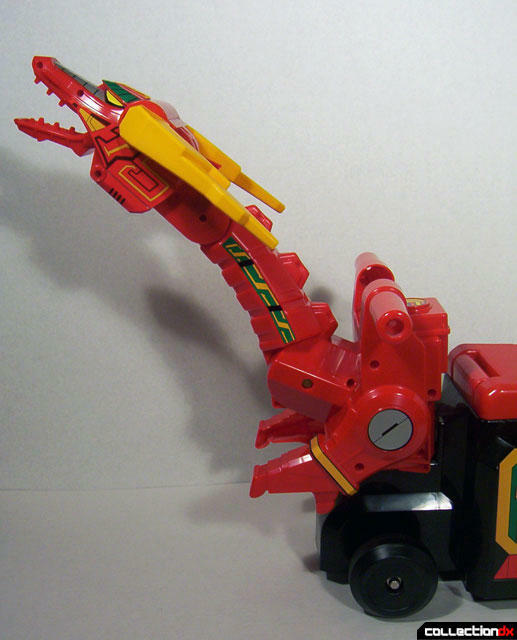 Mythical Chi Beast RyuuSeiOh (気伝獣龍星王) is from the Super Sentai series Gosei Sentai Dairanger and was released as an enormous riding toy by Bandai in 1993. It features a small seat on it's back that a child could sit on and a pair of handle bars by which to steer both the head and the front wheels. 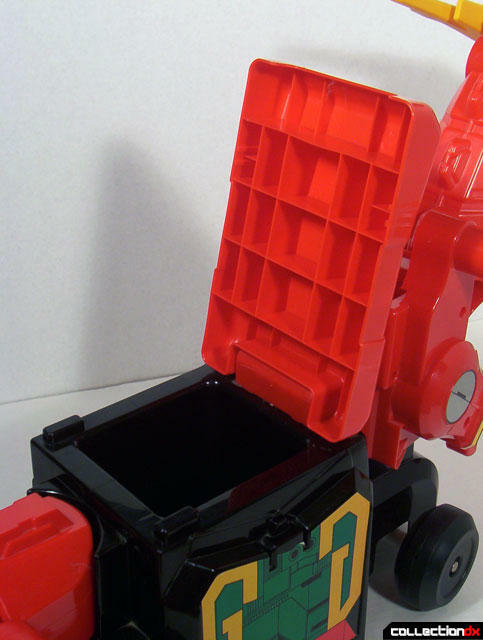 Though released long after the official line had been canceled, this toy is generally considered a part of the Jumbo Machinder family due to it's large size and heavy use of polyethylene in it's construction. 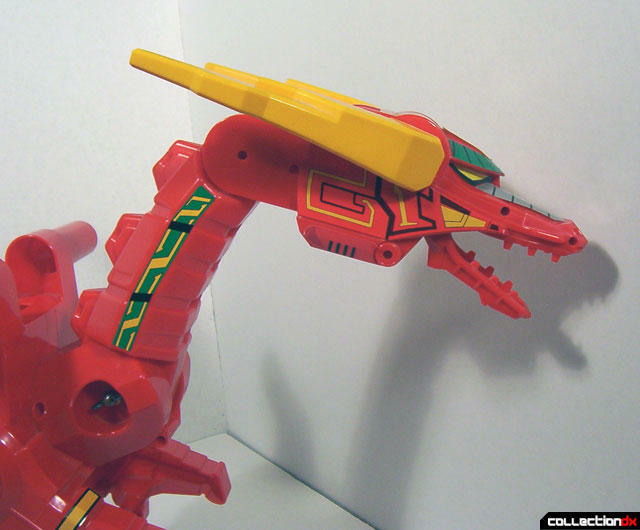 It also has two dragon shaped predecessors in the Jumbo line in the form of the Daiku Maryu and Dol Machinders. This toy is often overlooked by Jumbo fans. It's sentai stylings as well as it's odd shape are two likely factors contributing to this. The box for this thing is quite silly looking. 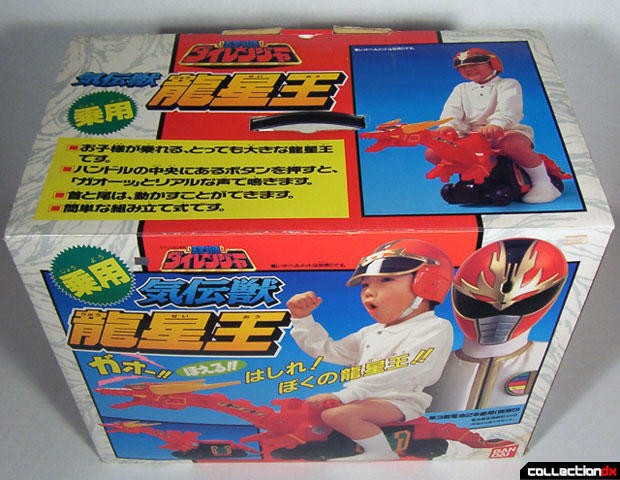 There's no fancy artwork to admire, but instead just a child riding on the back of the toy wearing a sentai helmet. Some collectors get a kick out of this sort of thing, but it's not likely to attract sales. Also, while the average Jumbo is about 23.5 inches tall, Ryuu Sei Oh checks in at 47 inches long! A drastic change from the norm to be sure and difficult to display as a result. Also it comes in a large box (21.5"x12.5"x17") so shipping on this thing can be prohibitive, even in the event that you find one for sale in the US, which is unlikely. Still, I thought I should have at least one of the dragon shaped Jumbos and since the cost of Daiku Maryu is quite prohibitive and I never cared much for Dol, I figured I grab one of these when I saw one on Yahoo!Japan a few years back. The toy comes in three pieces and needs to be assembled out of the box. It's a pretty self-explanatory how it's done, but an instruction sheet is included anyway. Interestingly, the sticker placement is indicated right in the midst of the the instruction and make no mistake, you need those stickers for this one! Without them, the toy is very plain looking and it's amazing how much they add to it's overall appearance. To put the toy together, just snap the back tail into the hole at the end of the main body and slide the neck into the front. Then just tighten that with a screw that's included. 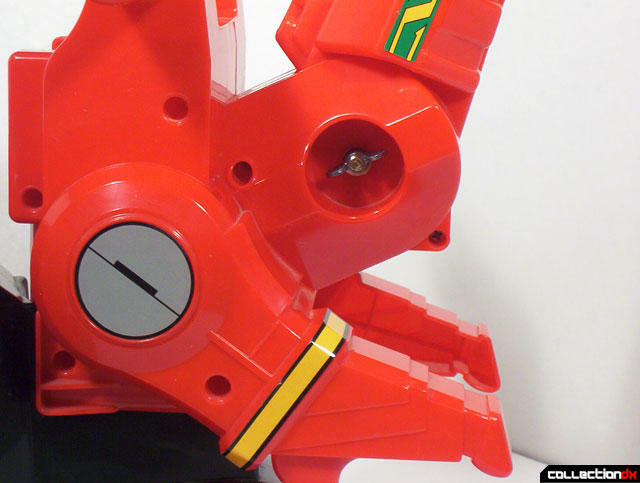 Be sure not to over tighten or at best the head becomes difficult to move and you may even crack the plastic here. Even without the screw, the head stays on pretty good, but it's best to have it there so that it doesn't come out when you position the neck, which is jointed in two places. 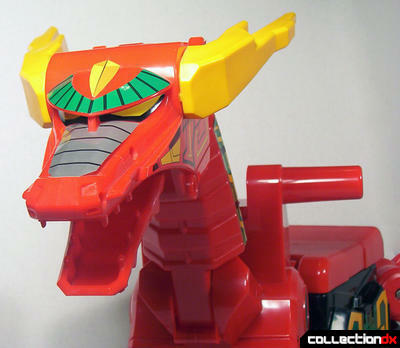 As I suggested earlier, when you turn the handle bars the whole front of the dragon turns as well as the front wheels. You can also turn the tail but this does not affect the back wheels. The back legs technically can be swiveled down, but they frankly can't go anywhere because they bump against the black chassis. 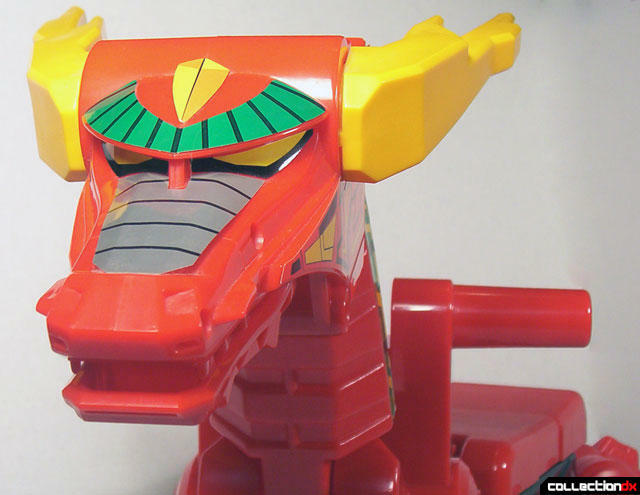 That's kind of lame, but at least you can open and close the jaw of the dragon. So, pretty decent toy, eh? Certainly a nice looking addition to your collection if you have room for it. But wait, there's more! Yep, if you lift up the seat, there is a secret compartment for storing things. And guess what else? Your pimp ride also includes the equivalent of a car horn! That's right. Located right in between the handle bars is a small circular button which when pressed emits a roar! This would make the Ryu Sei Oh the first "talking" Jumbo since the roaring Jumbosaurus Godzilla toy from 1978. The whole compartment beneath the button slides right out for easy replacement of the two necessary AA batteries. This is a pretty cool toy, but it's not for everyone. It's not that rare or expensive, but I don't think any of the other Jumbo collectors I know have bothered to pick one up yet. I can't say I blame them. It's jut not a "must have" Jumbo, but I dig it nonetheless. One last thing I should point out about it on the negative side though is that this guy has lots of little nooks and crannies. I tried to clean him off of dust for the pictures but it's sitting next to me now as I write and I'm ashamed to admit how many spots I missed! I was about to say it, but you beat me to it.